Chop – Peel and chop – 3 Potatoes – 1 Medium Cauliflower – Discard Stem – Seperate Florets – 1 Onion – small pcs. – 1 Bell Pepper – small Pcs. Stir – 1 tbsp. Crushed Flaxseeds – Stir well – 1 mnt – Sprinkle 1/2 tsp. Amchur Powder – mix – 1mnt – Turn off stove. Note : Adjust Salt and Spices to taste. Use Crushed nuts instead of Flaxseed if preferred. Spiced Potatoes with Cauliflower – Aloo Gobi packed with Flavors, Comforting, Simple and Easy Vegan Recipe garnished with Flaxseed. 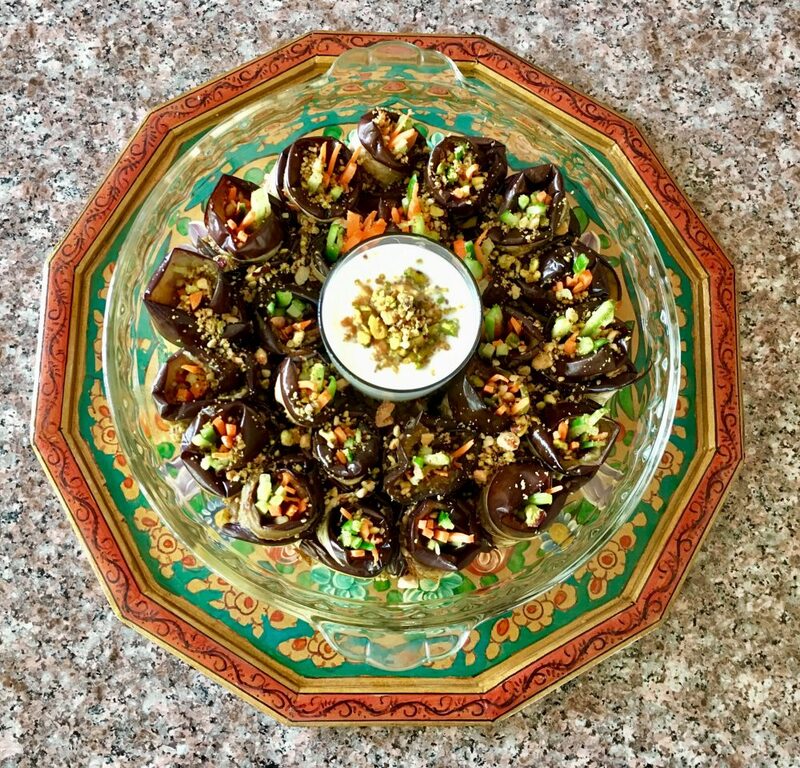 Easy Recipe for Eggplant or Aubergine rolls. Dramatic healthy veggie bites. Slice each eggplant lengthwise to about 3/8” to 1/2” (or 6 to 8 slices). Spread half the olive oil in a large oven pan over its entire surface. Place the eggplant slices in the pan and bake in 400°F oven for 20 minutes. Turn them over and bake them for another 20 minutes or until browned on both sides, using the remaining olive oil. Remove them from the oven and sprinkle the soy sauce evenly over the eggplants. Mix – Soaked items – ¼ Cup Olive Oil – ½ tsp Baking Soda – ½ tsp Salt – 1 tbsp. Lemon Juice – (Or Quick Blend – thick coarse batter) +/- extra water if needed. Pour – Batter – Baking Pan – Mix and Garnish – Handful Sunflower seeds – Pumpkin Seeds. Bake – Preheat oven – 160 C – 90 minutes. Note : Lemon Juice is important to activate the baking soda. Add Ghee instead of Olive Oil. Recipe for Gluten Free Sugar Free Eggless Bread. Delicious and Healthy All in One!! I call it the Healthy Healing Bread!! Garnishes play an important role in food presentation. It can be defined as “Food items placed around or on top of a principal dish for a relish”. A careful selection of garnishes that have flavour, colour, and eye appeal is appreciated and is accepted as a finished dish. In this post we are doing cabbage thoran/ mild spiced sautéed cabbage in an arc shape. Arcs add fluidity and a sense of motion to a presentation. Cabbage Thoran is one of the favourite side dish of Kerala Cuisine. Any Kerala Sadhya is incomplete without Cabbage Thoran. Cabbage Thoran is a stir fry made using cabbage and coconut. Cut – Peel and Chop – 1 Half Ripe Mango in pcs. Delicious Side dish for a Barebeque or with rice or Couscous. Note : Use Sour raw mango instead of Half ripe if preferred. Last weekend I made this for side dish. Our guests loved it so much, and requested for the recipe. Fr. Nevin you have already received the recipe by email the same evening. Hope you enjoy making it too. Recipe for Sweet, spicy and sour Mango Curry a Kerala classic and favorite. Simple to make and packed with a great depth of flavor. Perfect dish for seasonal mangoes that are slightly underripe to enjoy with Rice or Fried meats. Chop – De-seed and Chop 250g Soft Dates – Small pcs. Delicious Chutney to Enjoy with Pilaf or as Dip or Sauce for Snacks. Yummy!! Note : Adjust Salt and Spices to taste. Spice – 2 tsp. Sweet Pepper Powder – Stir Well – 6-8 chopped Tomatoes – Bring to Boil – 3 mnts – Pinch of Sugar. Garnish – Hand full Fresh Herbs (Basil or Coriander) – Drizzle Tsp. of Olive Oil – Turn off Stove done. Microwave – Pour Batter – Flat Bottom – Greased Dish – Decorate Chopped Banana – Sprinkle Pinch Cinnamon – +/-7 mnts. – Out of Microwave – Rest 5 Mnts. Slice and Serve Hot of Cold with rest of the Sauce. Note : Use Cardamom powder instead of Cinnamon. Use Jaggary instead of Sugar. Substitute Coconut Milk with Regular milk. Steam Cake 15 -20 mnts instead of Microwave if preferred. I have been craving this cake for the last few days. My mom made it all the time. But this is the first time I have tried this. The method and ingredients have changed slightly but the whole Appam was made and eaten in no time with beautiful memories of Amachi. Delicious and Easy Recipe from Kerala India – Ethakka Vattayappam / Rice Cake with Plantain Steamed or In Microwave drizzled with Coconut Sauce for Breakfast or Evening Snack. Blend – Boil 1 cup water –Add 250 g Spinach – 4 mnts – Drain – Cool – Grind to Paste. Microwave – 4 medium Potatoes – 6 mnts – till Soft – Peel – Cut Bite Size Pcs. Serve Delicous Saag Aloo with Rice or Chapati. Note – Adjsut Salt and chili to taste. Boil Potatoes instead of Microwave.